I decided the best way to showcase how well these collections coordinate was to create a quilt-like background. I found my Hexagon Sizzix Die and got to work! Even the stickers mixed and match perfectly. The flowers and leaves are from Friendly Forest and the border strips are from Happy Camper. 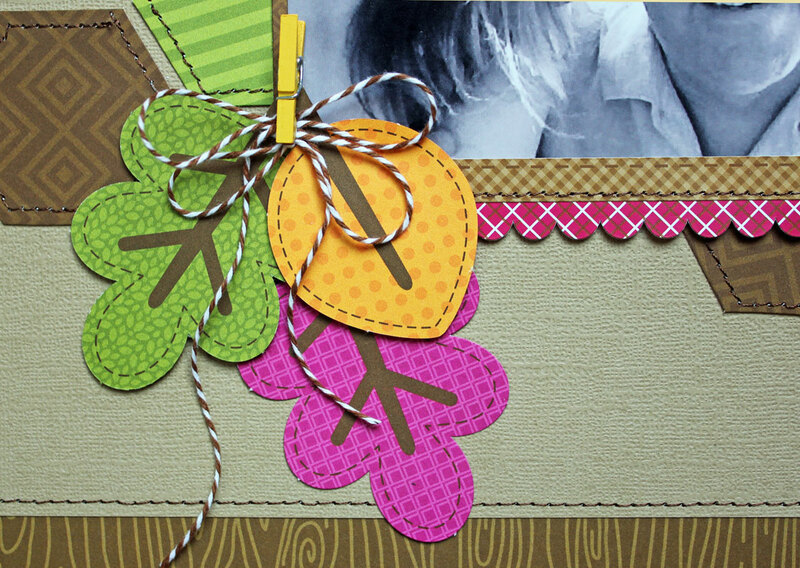 I also used some Fall Sprinkles and a Fall Mini Clothespin which are part of both collections! I love the fact that these collections work so well together! It gives me so many more options when I'm creating! That's it for me today. Make sure to keep stopping by the blog to see more inspiration from the Design Team! Thanks for stopping by! I love these bright, fun, fall colors! Awesome LO Kathy! Just gorgeous. Thank you, ladies! BEAUTIFUL photo and layout Kathy!!! 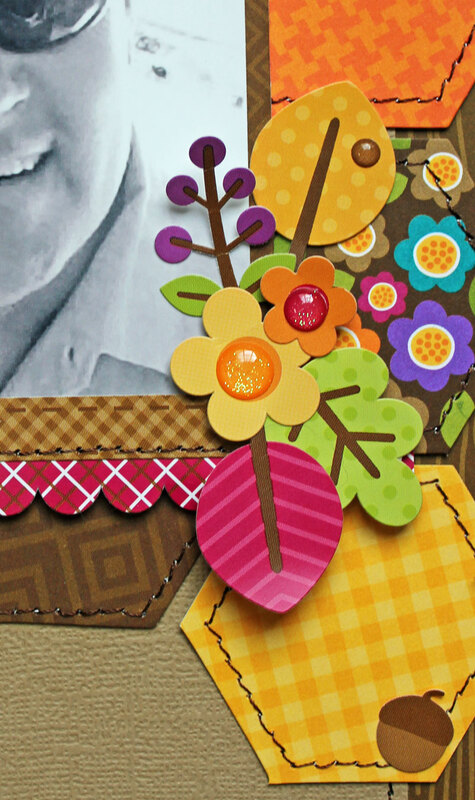 LOVE your hexagon patchwork and pretty papers, flowers & leaves - WOW - Happy Camper & Friendly Forest work PERFECTLY TOGETHER!!! OMG Girl WOW you truly did one outstanding super Fabulous, Awesome, Clever & Creative Job!! Love all of your ideas and you had them a plenty!! From Great Paper Choices love your Hexy's and my goodness your machine stitching is out of bounds awesome. and then your faux stitching is spot on perfecto too. YOU are one Super Talented Gal....Love the way you scrap and girl you do it with passion!!! YOU so ROCK!! What a gorgeous layout, I love the title and all of the fun details. The way you grouped the leaves with the twine and clothespin creates such a pretty embellishment. Love all of the hexagons and all of the stitching! I am absolutely floored by this jaw-droppingly beautiful layout!! Well thought out and gorgeously done!! Way to go, Kathy!! So impressive! !